Right from the classy red carpet reception by PRESTON CADILLAC and beautiful Cocktail lounge by HANDY Appliances to the awards show, every element of DARPAN Awards 2017 rightfully made it the top event of the city. DARPAN Extraordinary Achievement Awards was an unforgettable night. Right from the classy red carpet entrance to the awards show, every element of the event rightfully made it one of the top galas of the city. The red carpet was buzzing with prominent members of the South Asian community, political dignitaries and socialites; the beautiful cocktail lounge sponsored by Handy Appliances had guests mingling and enjoying the hospitality; the awards event and the fashion show added shine and glamour to the event. Indeed, DARPAN’s Extraordinary Achievement Awards was a magical night. DARPAN Magazine, hosted its 8th Annual Awards in the company of esteemed social, business and political elites. Ten amazing individuals from the South Asian community were recognized for their extraordinary achievements and for reflecting their heritage in a remarkable way. 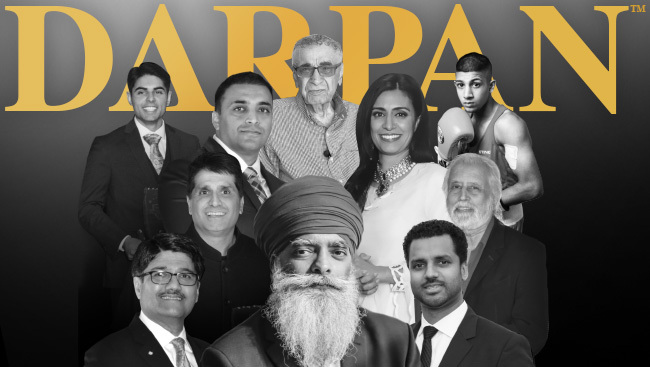 These 10 South Asians, identified as leaders, who embody the spirit of community and give back to greater Canadian society, were honoured with the prestigious Darpan Extraordinary Achievement Award. The spectacular event took place at Aria Convention Centre in Surrey. With over 700 guests in attendance, this black-tie affair commenced at 6 pm in the backdrop of glamour and grandeur. At the entrance, attendees were welcomed with champagne and a gorgeous ice sculpture depicting DARPAN’s journey of 13 years in publishing excellence, along with the latest luxury Cadillac Preston models on display. The media centre was abuzz as our red carpet hosts Nisha Khare and Mandeep Patrola interviewed our esteemed guests asking them their expectations for the evening; photographers were busy capturing beautiful moments; and a special celebratory wall showcased the DARPAN Award Winners of the last seven years. 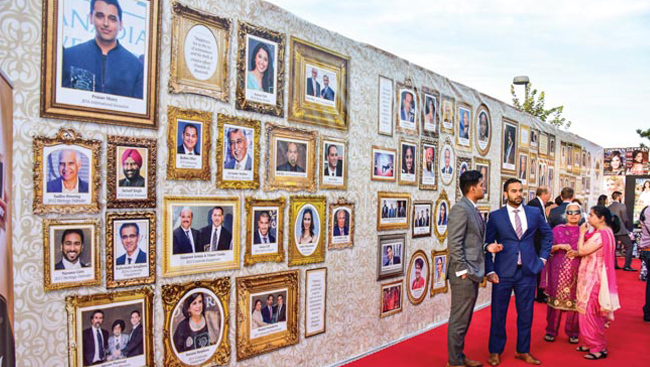 Blending with the theme of the awards, it proudly highlighted the progress and achievements of the South Asian community in Canada and DARPAN’s long-lasting tradition of honouring them. Canadian actor and television personality Huse Madhavji, who flew in from Toronto, was the Master of Ceremonies for the event. This multi-talented host, actor and producer is the former face of Star! Canada and has starred in HBO Canada/Direct-TV’s hit comedy Call Me Fitz where he received his first Gemini nomination, ABC/ Global’s Combat Hospital, crime film Cold Blooded; and NBC/ CTV hospital drama Saving Hope. MC Madhavji kicked off the festivities, which also included an introductory live performance by Diljaan, an Indian singer known worldwide for his great voice, and Shweta Subram, an Indo-Canadian Bollywood playback singer with multiple awards, along with dancers of SHIAMAK Dance Academy. Their high-energy gig got a huge round of applause and marked the beginning of a successful and memorable evening ahead. Our honoured guest, Surrey Mayor Linda Hepner, took the stage to share a few inspiring words with the audience, followed by speakers Blaine Forer, Vice President and District Manager, BC, of Canadian Western Bank, and Serge Corbeil, Director, Government Relations for Air Canada. The highlight of the evening was our Guest of Honour Ravi Singh, Founder and CEO of Khalsa Aid organization. Khalsa Aid is an international NGO with the aim to provide humanitarian aid in disaster areas and civil conflict zones around the world. The idea of taking the concept of langar aka Sikh community kitchen to people or regions that needed it the most gave birth to Khalsa Aid organization in 1999 in London, United Kingdom. Starting with the first mission in Kosovo, Singh has worked in war-hit zones like Syria and Yemen; helped multiple countries struck with disaster like the Nepal earthquake, famine in Kenya, and Indonesia Tsunami; and aided refugee camps in Greece, Lebanon and Congo, among many others. Singh is a recognized advocate and speaker on humanitarian causes and has spoken regularly on national and international media on topics from the importance and dangers of field work to being a voice for oppressed minorities. He was rewarded for his commitment towards providing relief aid to Burrowbridge, Somerset, during the flooding there. In 2016, BBC made a documentary around Singh’s work in Northern Iraq titled The Selfless Sikh: Faith on the Frontlines. The film follows Singh’s journey as he provides aid to Yazidi families who have fled their homes to escape the brutality of Islamic State. As Keynote Speaker, Singh shared on stage his passion for the relief work and dedication towards the cause. While subtly narrating his experiences serving and helping people around the world, he encouraged every member present at the awards to support his work and believe in humanity and charity. 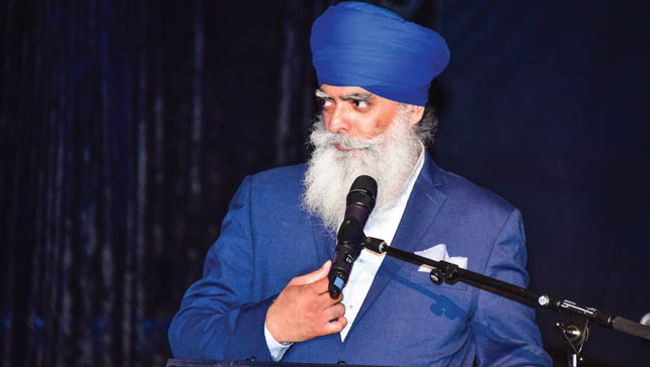 His strong words touched many hearts that night, so much so that many prominent members of the business community declared their donation to Khalsa Aid throughout the event. The amount donated was over $140,000, which will be utilized towards Khalsa Aid’s current relief efforts in assisting the Yazidi women survive the capture of ISIS fighters in Yemen. Khalsa Aid has been providing the distressed Yazidi women food, shelter and support and is putting their best efforts in providing them a better standard of living. MC Patel’s energy and witty sense of humour kept the guests engaged and entertained. Many known figures and celebrities from within the community and British Columbia graced the occasion with their presence. Spotted at the event were BC Minister of Citizens’ Services Jinny Sims; Parliamentary Secretary for Sport and Multiculturalism of BC and MLA Ravi Kahlon; MLAs Raj Chohan, Stephanie Cadieux, Rachna Singh, and Marvin Hunt; and MPs Sukh Dhaliwal, Jati Sidhu, Dianne Watts and Randeep Sarai, among many others. Guests from within and outside the community added glamour and style to the night with their colourful, graceful and fashionable outfits. The breathtaking fashion showcase by Frontier Bridal Boutique was simply captivating. 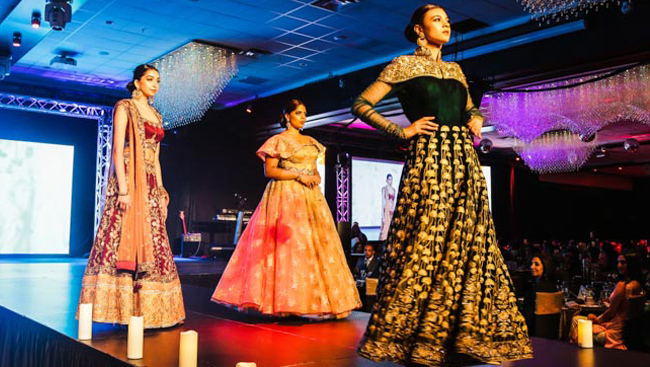 Showcasing an extensive range of traditional Indian wear for men and women, the high-end boutique has become a popular name for the latest and very best in South Asian haute couture in Surrey. The fashion brand showcased an extravagant collection of Indian and western fusion and introduced its Spring Bridal collection comprising of vibrant colours, intricate designs and classy styles. The breathtaking show, gorgeous models, and impeccable background music got a deserving applause and appreciation from the guests. The awards session – the main element of the event – was all about achievements, excellence and community spirit. Ten amazing individuals from the South Asian community were recognized for their extraordinary achievements and for reflecting their heritage in a remarkable way. This year, DARPAN Awards had a wider representation of South Asians in Canada as it included an award winner from Victoria (Sardul Gill - Advancing Philanthropy) and also from Calgary (Manjit Minhas - Corporate Engagement). This demonstrated the growth and reach of the event in its mission to celebrate and honour the contributions of South Asians. The never-ending applause by the guests, along with the inspiring thank you speeches by the winners generated a feeling of pride and unity at the event. For the finale, guests enjoyed musical entertainment by Diljaan and Shweta who set the mood at the event with their sensational voice and foot-tapping music. The atmosphere at the awards night was lively. There was music, food, glamour and beautiful people having a great time. 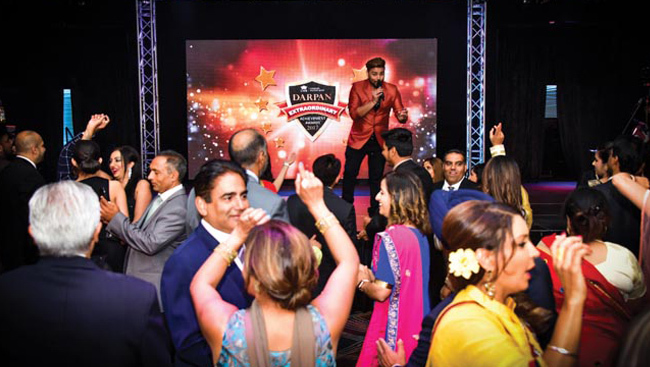 Guests were seen dancing, mingling and having a memorable evening – making DARPAN Awards a successful event and a night to remember. Adding more shine and sparkle this festive season, the beautiful actress shares with DARPAN her thoughts and special memories associated with the festival of lights. Singh, founder of international non-profit aid and relief organization Khalsa Aid, has taken it upon himself to create a world that believes in equality and charity. Through Khalsa Aid, he has been reaching out to various corners of the earth helping those in need and in turn rekindling people’s trust in humanity. Satnam was born in Ballo Ke in Punjab – a small village with a population of about 800. At a young age, he decided to pursue basketball and enrolled in a sports academy in Ludhiana. In present times, the Bollywood heroine – an entity of beauty, glamour, values and love – has definitely expanded her scope and Sonakshi Sinha is one such actress leading the way in rebranding the stereotypical Bollywood actress into a fierce all-rounder lead. She has had a busy day, filled with meetings and work commitments. After a quiet dinner, Anushka Sharma sits down to chat with DARPAN. 2016 was a great year for the South Asian community. It was filled with promising initiatives taken up by most of our members and great achievements/honours received by many. It was only ideal to start 2017 by remembering these personalities and applauding them for making the community proud. This is how the idea of DARPAN’s 2016 Newsmakers came into being.